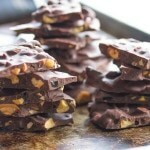 Note: Although I mention Valrhona chocolate in this post, I was not compensated by this brand. All opinions are my own. This was my first time making chocolate bark. I’ve seen recipes here and there, but never was interested enough to attempt it. Somehow the combination of chocolate and cherries sparked my interest. In fact, this bark has many of my favorite snacks all under one roof. The combination of sweet and salty has always been one of my favorites. The chocolate I used was Valrhona. I’d always heard that this was some good chocolate, and indeed, it was! Many years ago, I used to work with someone who had gone to culinary school and he loved to bake. He would always use Valrhona chocolate, but I had difficulty finding it. Fortunately, I spied some in my local Trader Joe’s this week. If you can’t find Valrhona, any of your favorite dark chocolate will do just fine. When the chocolate has melted, add the remaining ingredients and stir well to incorporate. Cover a cookie sheet with parchment paper or tin foil and spread chocolate mixture (about 1/4 inch thick) on top. Break apart and enjoy! To store, follow directions on chocolate wrapper. 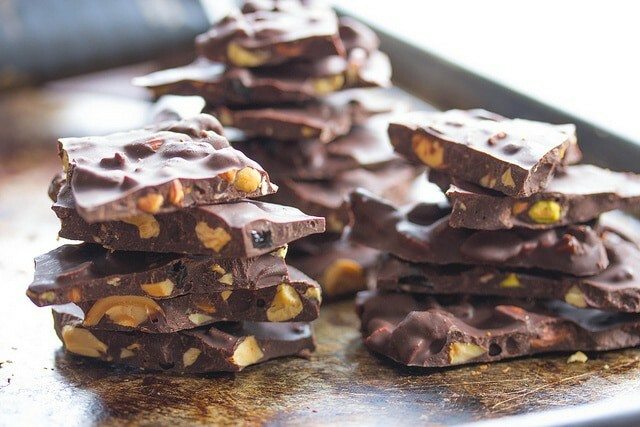 This looks like a wonderful combination for chocolate bark! I love all of the things in it, and I have a bag of dried cherries just waiting to be used. Pinned! This does not pour into a sheet pan. I made a batch and a half and still didn’t fill a 15×10″ pan. As soon as you add the honey it starts to solidify and can’t hardly get the cherries and nuts mixed in. Any suggestions??? ?